The German marque formerly had a limited footprint in compact car classes, but now there are a handful of affordable autos available, from as little as $36,900 plus on-road costs. Indeed, there’s the entry-level A-Class, then there’s the more practical B-Class, and Benz has recently added the new CLA-Class Shooting Brake small wagon. So, we thought to ourselves, why not try and figure out which is the best buy? Oh, and rather than go for the boring base models, we’ve chosen sporty models – the A250 hatchback, the B250 Sports Tourer, and the CLA250 Shooting Brake. Given that we took the CLA wagon we thought we’d leave out the Coupe (really it’s a sedan!) and while we asked for GLA250 to complete the Benz small hatch set, there wasn’t one available. Between the A, B and CLA models there have been 6283 sales so far this year, and if you add the GLA crossover to that the total, it jumps to 8232 sales to the end of August 2015. All told, the small-car family for Mercedes-Benz accounts for more than 34 per cent of all the cars the brand sells. So picking the right one is important. The most affordable model here is the A250 Sport, which kicks off at $51,000 plus on-road costs. The mid-range offering is the B250 4Matic, which costs $54,200 plus on-road costs. 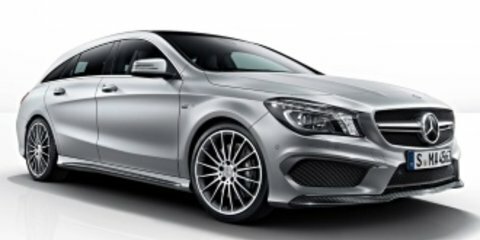 And the CLA250 Sport 4Matic is by far the most expensive, at $66,400 plus on-road costs. So, why so much more for the small Mercedes-Benz wagon? Part of it comes down to standard kit. The rest of it, cynics might say, is because Benz can. Actually, the CLA has standard-fit items such as 18-inch alloy wheels, Benz’s “intelligent light” system with LED lighting and high-beam assistance, a panoramic electric sunroof. The B has 18s as well, but unlike the CLA the B has Artico man-made leather and Dinamica synthetic suede. It is the only car here with ambient interior lighting, however, and there are 12 colours to choose from. The A-Class is lacking a bit of kit compared to its compatriots, and it makes do with a smaller 5.8-inch media screen where the others get an 8.0-inch media interface, but hey – the A is notably cheaper. Standard goodies fitted to all three models include dual-zone climate control, keyless entry and push-button start, six-speaker stereo with Bluetooth phone and audio streaming, and satellite navigation (Garmin for the B and CLA, and an older in-house Merc system for the A – though our CLA had an optional new-tech Comand APS unit with better graphics and newer software). All three have front and rear parking sensors, an automated parking system, a reverse-view camera and, in the B and CLA, an autonomous emergency braking system – the updated A-Class due late this year will have that. Further, there is attention assist drowsiness monitoring, and nine airbags (dual front, front side, rear side, full-length curtain and driver’s knee). The B and CLA also have blind-spot assistance, but the flagship A45 AMG is the only A to get that. Sizing them up, the A is clearly the smallest on the outside, and it can’t claim the cockpit practicality of the other two. But smaller is often better for urban dwellers, and that’s exactly who it’s aimed at. The B is taller, longer and wider on the outside than the A, and that translates to better space on the inside – the boot, at 488 litres, is a particular highlight. The CLA Shooting Brake, though, has even more boot space – its cargo hold is 495L, accessed through a narrow electronic tailgate opening (the A and B have manual boot-lids). The A-Class has a comparatively tiny 341L of room in the boot, and it also has a pretty tight aperture, too. While the numbers may be better for the CLA, the B-Class’s boot is user-friendlier. It has a broad opening that makes loading prams, pushbikes or other bulky items simple, and a lower boot lip aids that. Further, the B-Class’s boot floor can be switched to create a long, flat load space with the back seats folded down. The B-Class also has its sister models nailed for back seat space, too, with good head, leg and toe room. If you regularly take adults on trips – or if you have tall kids – it’s entirely comfortable, where the A and CLA are considerably more cramped, and both of those models have worse ingress and egress due in part to their high sill-lines and limited foot space. All three look the part in terms of cabin fit and finish, though the CLA is clearly the CLAssiest … sorry. In our CLA the dashboard featured a swept metallic finish, while the real leather trim and red seatbelts give it an edge over the A and B, both of which had more youthful carbonfibre finishes on the doors and dash and the man-made leather-look material instead of proper cowhide. The A-Class’s smaller media system also has an affect on the ambience of that car’s cabin (namely that old-school menu system and older, more pixelated map software – all of which will be remedied with the updated A-Class later this year), as does its older steering wheel design. However, the A-Class shares the same sporty bucket seats as the CLA and that man-made leather trim feels like it has a little bit more bum grip through bends, although some may find its driving position compromised by a small footwell. The seating position in the CLA-Class is quite similar – low-slung and sat in a sporty seat – while the B-Class has a much higher set seat that allows much better outward vision (and that’s further aided by the body shape of the B, with its mass of glazing). The B-Class is obviously a hugely practical car but it isn’t as sporty inside as the other baby Benzes, with more conventional front seats, and a less sporty presentation. The CLA’s updated media menu system – the same as you’ll see in the C-Class or S-Class – adds to its upmarket feel. Combine that with the rest of its swag, and it’s probably the pick if you value extroverted, up-to-date stuff. All three of these cars have 2.0-litre turbocharged four-cylinder engines with seven-speed dual-clutch automatic gearboxes, and all three have identical levels of grunt: 155kW of power and 350Nm of torque. The nature of this four-cylinder turbo Benz engine is rorty rather than overtly refined, and while it revs freely and willingly, there are a few issues that you’ll find no matter which version you drive. In Eco mode (that’s the default drive setting), for example, the drivetrain will shift up through the gears to help save fuel, and you find yourself prodding the right pedal harder than you ought need to. Flicking it to Sport mode remedies that, but it can be a bit annoying as it will hold gears longer than often necessary. Further – no matter what drive mode the car is in – the dual-clutch gearbox can stumble, particularly in slow-moving traffic. That lurchy nature at low speeds could be frustrating over time. That said, if you keep any of these cars revving in their respective sweet spots – from 2000-4500rpm – you’ll be rewarded with rapid progress and, in Sport mode, a crackle-pop exhaust note that’s addictive, particularly if you lift off the throttle higher in the rev range. It’ll do that in Manual mode, too, and that’s where we found the most enjoyment (all three have paddleshifters as standard). 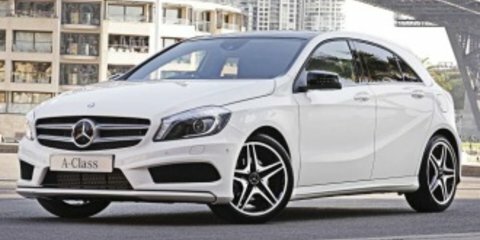 The A-Class is better on fuel than both of its stablemates, with claimed consumption of 6.6 litres per 100 kilometres. 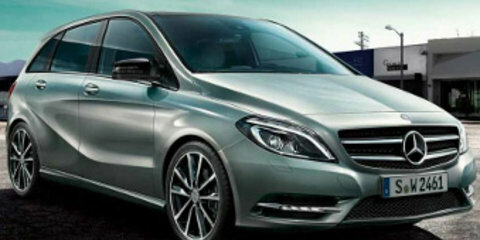 The B250 uses a claimed 6.8L/100km, while the CLA250 uses a claimed 6.9L/100km. On test, the A-Class was reading in the high 9L/100km range, while the B and CLA were up above 10L/100km. There’s a massive difference between how the all-wheel-drive B250 and CLA250 handle corners when compared to the A250. And it’s a divisive distinction depending on if you prefer the assured, surefooted feel of all-wheel drive, or the freer, livelier experience of a pushy front-driver. Indeed, the all-wheel-drive system in the B250 and CLA250 helps both of those cars feel more stuck to the road – the CLA to a greater extent because it has suspension developed by Benz’s sports specialist brand AMG, where the B has lowered ‘comfort suspension’. The CLA is more of a weapon, feeling stiff and sharp through twisty stuff, where the B rolls from side to side more, and lacks the poise and balance of the CLA. The A250 is a more thrilling and involving car to drive than either of its AWD counterparts, because its front-drive setup enamours it with more tactile steering that is sharper at turn-in and quicker to react mid-corner. In fact, the A250’s rear end will step out if you lift off the throttle in corners, and while it may catch you out at first, it is manageable and, let’s be honest, good fun. And just like the CLA, the A250 has the lowered sports suspension developed by AMG. The extra size of both the B and CLA means neither feels as nimble in the twisty stuff, either. You can feel the extra mass of the Sports Tourer and Shooting Brake. Of course, whichever model best suits your needs will be the car you’ll probably go for. However, in terms of the best small sporty Benz, it’s a bit more clear-cut. The CLA Shooting Brake combines a lot of the good points of these three, though it is quite expensive in comparison, and that could be enough to rule it out for some. The B is the best blend of practicality and passenger-friendliness – sure, it’s probably the least exciting to drive, but if you’re after a pragmatic, price-friendly choice, this is it. The A is the driver’s pick, and the one I’d choose – and not only because it’s the most affordable. It doesn’t have the standard kit, but it does have sportiness on its side.